Bath’s Tori Dackin takes a shot during a McDonald’s Holiday Tournament semfinal against Bellevue at Bath. BATH TOWNSHIP — Bath has won 16 of the first 20 McDonald’s Holiday Tournaments that have been held. They won’t win number 21 in the 21st edition being played this year. Bellevue came to town and knocked off the host Wildkittens by a final score of 44-33 Friday night in the second game at Bath. Both teams were undefeated with Bath at 8-0 and Bellevue at 9-0 so it was obvious that something was going to have to give. The two came out in man to man defenses and they both struggled at times but managed to escape the first quarter tied at 14 each. The Lady Red used a small 10-8 advantage in the second stanza to grab a 24-22 going to the half-time break. The Wildkittens struggled in the first half with missed close in shots that could have led to them grabbing the lead. 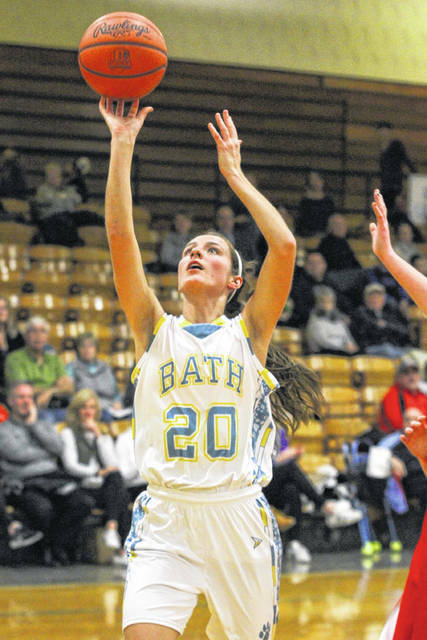 Bath outscored Bellevue 10-9 in the third period to get to with-in one point down at 33-32. The Wildkittens fell behind as Bellevue rattled off three straight buckets to open the quarter and Bath was forced to attempt the comeback from behind the three-point line. But they went 0-for-9 from behind the arc in the quarter and scored their only point of the final period when Tori Dackin made one of two free throws with only 26 seconds left to play. The Lady Red outscored Bath 11-1 in the decisive final quarter to grab the win and advance to Saturday nights championship game. Casey Santoro paced Bellevue with a game-high 21 point effort while Lindsey Singhaus totaled 11 points for the Wildkittens. The opening game of the evening saw the Wildcats remain undefeated as they improved to 9-0 with the overwhelming victory over Start. The contest was decidedly lopsided in Minster’s favor as they exploded to a 15-2 lead after one period and never looked back. Their smothering man to man defense held the Spartans scoreless in the second quarter – but Minster also struggled and scored only five points - and the Wildcats took a 20-2 lead to the half. After opening the third quarter with a 16-0 run to extend the lead to 36-2, Start scored their only basket of the third period with 10 seconds left to trail 36-4. With all the Minster starters out of the game, the final quarter saw the two squads battle to an 11-11 stanza to account for the final score of 47-15. Junior center Courtney Prenger, who has verbally committed to Xavier, led the way with 12 points while team-mate Taylor Kogge chipped in with 11 points for the Wildcats. The Minster defense held the Spartans (3-4) to a 6-for-43 (13 percent) shooting night from the field. Bath will meet Start in the consolation game at 6:00 Saturday evening and Minster and Bellevue will follow for the championship. This entry was tagged bath, Minster. Bookmark the permalink.